Already, Austin Rogers total winnings places him among the game show’s all-time winners. With a total of $411,000, he’s firmly cemented himself in the top five Jeopardy players in terms of most money won in history; nearly a full one hundred thousand in front of Arthur Chu. He won again on Wednesday’s episode and is comfortably over $400,000 — just a couple quirky answers from overtaking Matt Jackson, the fourth Jeopardy player on the all-time list. If you’ve been following along recently, Rogers has endeared himself to the majority of Jeopardy fans with his playful, smiley self. He’ll stare directly into your soul and wave at you through the television. He loves fooling around during the introductory theme song when they announce the contestants, he says “whatever” when he gets a answer wrong, and often has ad hoc back and forths with Alex Trebek. And that’s just the tip of the iceberg with his antics. You just have to watch him. Austin has already set a couple records. In his fifth and sixth wins, he etched his name in the Jeopardy! record books for the high one day winnings, taking home $65,400 and $69,000 respectively. Those win totals weren’t records, or the most in Jeopardy history, but they’re good for top five all-time. 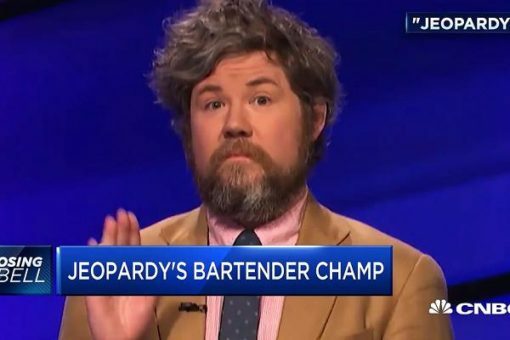 Wherever the 38 year old freelance writer and bartender ends up from here on out, he’ll definitely be remembered not just in the record books as one of Jeopardy’s top players of all-time, but he’ll be warmly remembered in our hearts, too. Gross. Where is Brad Rutter on the list?